Following the footsteps of its nova 4 predecessor, the Huawei nova 4E looks to join Phonerated's list of the best smartphones for photography with its competitive rear camera setup. Before we jump into its pros, though, we took note of some of its slight cons. For starters, this nova model does not come with NFC (Near Field Communication) support , a somewhat ubiquitous wireless technology that's offered by a lot of lower-specked contenders available as of this specs-based review. Moreover, it only comes with 3340mAh of power , whereas a few of its older Huawei cousins pack at least 4000mAh in the tank. 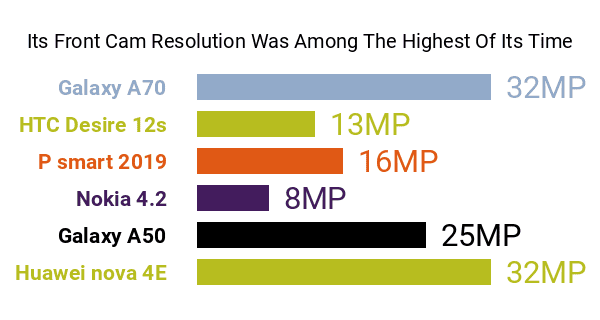 Heading over to its imaging pros and cons, despite not having the ultra-high-end caliber of the nova 4's 48-megapixel main lens, the nova 4E's triple-lens rear camera nevertheless makes the flagship cut, combining a 24-megapixel main cam with an 8-megapixel wide-angle cam and a 2-megapixel depth sensor, while 3D Panorama and electronic image stabilization lead its perks. Keep in mind, though, that it only captures FHD-1080p videos -- some of its high-tier rivals record QHD-1440p videos. The nova 4E also looks to go toe-to-toe versus the best selfie smartphones of its time, touting an AI-powered 32-megapixel selfie camera on its screen's dewdrop notch. Under the hood, it runs on a 2.2GHz octa-core Kirin 710 processor, which, although won't plug it into our list of the best eight-core smartphones, still sounds respectable in our book. Joining its hardware pros and cons is a robust 6GB RAM , a Mali-G51 1GHz GPU, and a 128GB internal memory that can be expanded by a maximum of 512GB. Also among its features are a phablet-esque 6.15-inch 2312 x 1080 Full HD+ display, a fingerprint scanner, and a 3D glass design coated in either Peacock Blue, Midnight Black, or Pearl White. All said, Huawei's nova 4E caters to users who are into mobile photography and heavy multitasking.